This fruit assortment holds a quartet of milk and dark chocolate-covered fruit made in Hary & David's candy kitchen. There are dark chocolate-covered cherries and milk chocolate-covered cherries, blueberries, apricots. Each glossy bite bursts with rich chocolate and refreshing dried fruit. It's a gourmet gift and a way to savor summer's fruit all year. 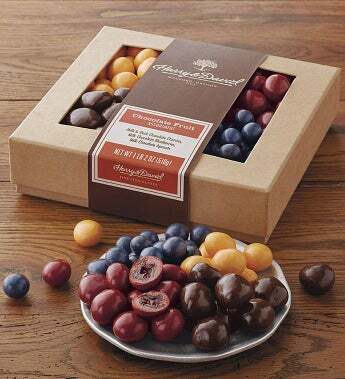 This fruit assortment holds a quartet of milk and dark chocolate-covered fruit made in Harry & David's own candy kitchen. There are dark chocolate-covered cherries and milk chocolate-covered cherries, blueberries, apricots. Each glossy bite bursts with rich chocolate and refreshing dried fruit. It's a gourmet gift and a way to savor summer's fruit all year.